The Willow Fork Drainage District (WFDD or the “District”) tax rate for 2018 is $0.185 per $100 of assessed value. The 2018 tax rate of $0.185 per $100 of assessed valuation is comprised of a debt service component of $0.085 and a maintenance component of $0.10. $0.09 of the 2018 maintenance tax funds drainage maintenance and $0.01 of the 2018 maintenance tax funds recreational facilities maintenance. 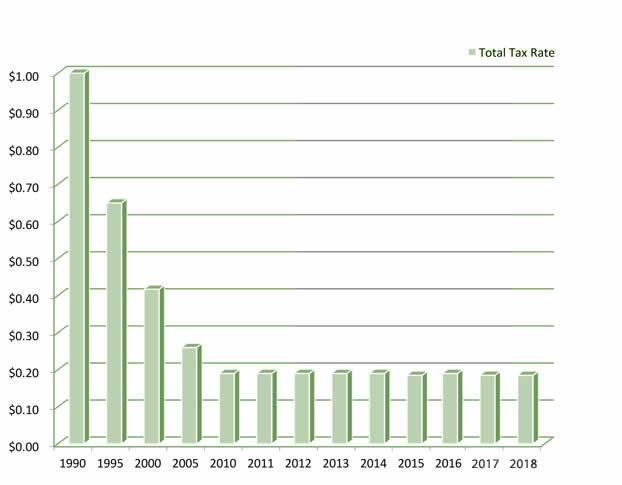 The District has gradually decreased its tax rate since 1990 when the initial tax was approximately $1.00 per $100 assessed value. To whom do I pay my taxes? Taxes are paid to the Fort Bend County Tax Assessor/Collector, regardless of whether you live in Fort Bend or Harris County. Remit payment as indicated on the bill. Why do I have to pay taxes to WFDD when I already pay taxes to Fort Bend or Harris County? WFDD is a separate political entity that was created to construct, operate, manage, and finance drainage and recreational facilities within its boundaries. It collects a tax for those purposes. When are WFDD tax bills due or delinquent? Tax bills are generally mailed in October for the current tax year or as soon thereafter as possible. Taxes are due when billed and become delinquent after January 31 of the following year. For example, 2018 tax bills mailed in October 2018 become delinquent after January 31 of 2019. Does WFDD offer a homestead exemption? WFDD offers a homestead exemption annually for all residents over the age of 65 or for disabled persons living in the District. In 2018, the District granted a $50,000 exemption from taxation of the appraised value for those individuals. A person qualifying for both may choose the exemption he or she wishes to apply but may not claim both. Exemptions can be filed with the Fort Bend or Harris County Appraisal District, whichever is applicable. Can I protest my tax value? WFDD levies its tax based on values certified by the Fort Bend and Harris County Central Appraisal Districts. To confirm or protest values or inquire about exemptions, contact the appraisal district where your property is located, either Fort Bend County Appraisal District or Harris County Appraisal District. 2012 – $5,980,000 in bonds were issued to fund Phase I of the District’s park plan, including open space enhancements and park facilities at 10 Katy ISD schools within WFDD’s boundary, a community Central Green, ball field improvements at Freedom Park, and the first phase of Exploration Park along the District’s diversion channel. WFDD completed park facilities at the 10 schools, ball field improvements at Freedom Park, Central Green Park in LaCenterra, and phase one of Exploration Park in 2014. 2015 – $9,800,000 in bonds were issued to fund Phase II of the District’s park plan, which included phase two of Exploration Park, 32-acre Willow Fork Park, and phase one trail enhancements. Phase II was completed in 2016. 2017 – $9,780,000 in bonds were issued to fund Phase III improvements, which consist entirely of trail extensions and enhancements within WFDD and are expected to be substantially complete by the end of 2019.